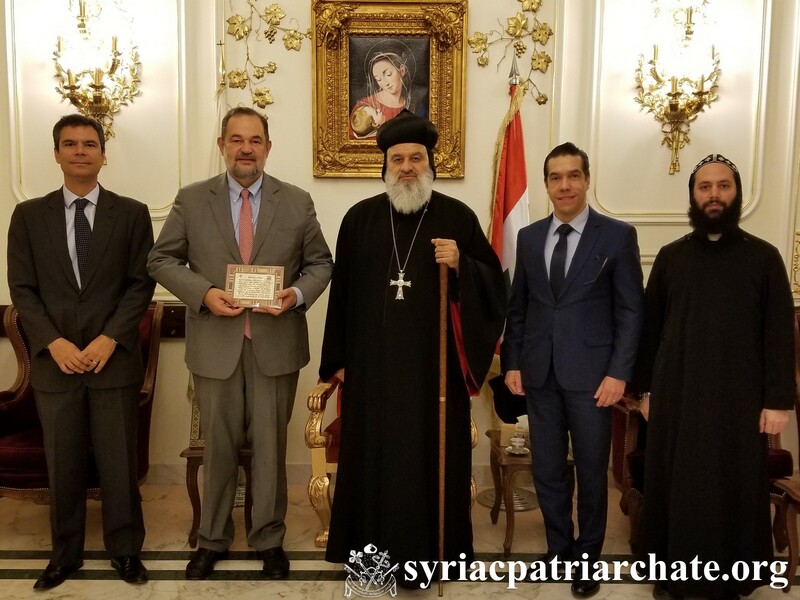 On March 23, 2019, His Holiness Patriarch Mor Ignatius Aphrem II received their Excellencies: Mr. Paulo Cordeiro de Andrade Pinto, Ambassador of Brazil to Beirut, Mr. Fabio Vaz Pitaluga, Ambassador of Brazil to Damascus, and Mr. Jandyr Ferreira dos Santos Junior, Deputy Chief of Brazilian Mission, at the Patriarchate Headquarters in Bab Touma – Damascus. His Holiness welcomed his guests and discussed with them the situations in Lebanon, Syria, and the Middle East. They also spoke about the presence and role of the Syriac Orthodox Church in Brazil. His Holiness and his guests assured the importance of helping Christians remain in the lands of the forefathers. The meeting was attended by Very Rev. Raban Joseph Bali, Patriarchal Secretary and Media Office Director.